Here's the deal. I was going to tell the great news, that I picked up the Ipod which I never had disposed of, plugged in Boy13's earphones, and voila, it was working. I then switched to another pair of earphones, and nothing happened. When I switched back to the other earphones, still nothing. So I was all disapponted and didn't feel like reporting all that. Then I decided to charge up the Ipod, since maybe it just only had enough juice to play 1 1/3 songs. Today it is magically working again. I am so happy. I also have time to write since I finished my research paper today, and played about 100 games of Spider Solitaire. That's my new stress buster. I have only one the two suit game once! I often lose the easy game, which I heard is impossible (except for imbeciles like me). So, for school I am down to two last classes, including going out to dinner on Monday after one hour of class, one final exam, and a 5-6 page paper I've started a little on and it will all be over December 12th. I'd forgotten what a great feeling the end of the semester is. I will have nothing hanging over my head. I did always remember that feeling of always having something to do, but truthfully, I am handling it a lot better than I did in college the first time around. I have never been really concerned about not completing assignments or doing well so far. I have felt overwhelmed and bewildered about how I would complete everything, if that makes sense. Once I write out a little plan for myself, it becomes do-able. Okay, that's the only picture I could find on the desktop computer to post (amongst all the Jeter/A-rod,Grateful Dead/Wolfmother pictures the boys have collected). I have all my photos on the laptop. 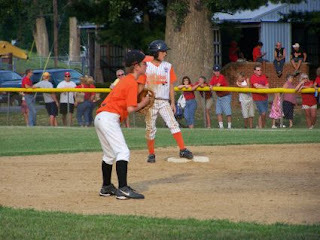 That's Boy13 over a year ago in an all-star game. 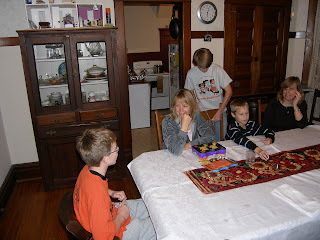 We finished up our family weekend with dinner at my mom's house followed by games. Whoonu again. This is where the person who is it, gets a card from every other player with different words on it, and has to choose his favorite things in priority order. For example, Nephew8 might choose cotton candy, bubble gum, miniature golf, chocolate cake and ketchup in that order. The person who gave the card with the top honors, get the token with the most points and so on down the line. Cards move to the right, and the next person in line is it to choose their favorite. Anyway, it's very quick, easy and playable for all ages. After a round of that won by Boy14, we switched to Apples to Apples and Boy14 won that, too. Then my sister showed me how (tried to) to play Sherlock on the computer. She called it a logic game, but I called it insanity. I came home to relax with a few games of Spider Solitaire (easy version, and no I don't win everytime, so that makes me either a real dummy or just impatient). Madz, thanks again. Once I accomplished posting the YouTube video, I thought I'd try a different picture placement in html, and it worked! 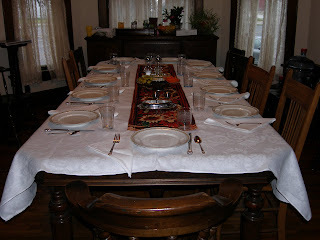 That picture is actually from Thanksgiving Night, but close enough to our game tonight. Try finding a movie to please ages 8 to 46. I have to recommend a movie called "Mr. Magorium's Wonder Emporium" even though over half our party tonight didn't like it (all the teenage males plus Pat). Betsy, Nephew8 and I all liked it. Perhaps I liked it best. The theme was to believe in yourself and anything can happen. Also, to enjoy the little moments in life. Like looking down the row in the movie theater and seeing all my boys lined up. At dinner Boy13 asked Boy19 how long it had been since he went anywhere with us. He replied, "Seven years." I'm sorry to say it's quite possibly true. Well, we had tonight. It was magical. 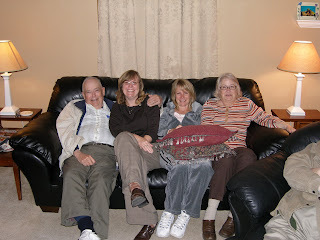 The above is a picture on Thanksgiving evening of my Great Uncle Cal, sister Betsy, me and my mom. We were watching a hilarious movie the boys spent all day making about a European rock star named Ricky Merrciaeux who disses a young boy for an autograph and has to pay later on. You have to guess the five differences in the two pictures above. There's also a bonus, that I don't think anyone will find. I have to admit when I was looking at the table it was easier to see the differences. Sorry I'm not a better photographer, but I thought it would be fun. The chair in front is not part of the game, I just didn't set the camera up in the same spot. My first idea was to photograph the table in gradual stages of preparation, but I got distracted with this find it game, and then the turkey button popped prematurely, and I had to make the gravy. Madz, you are so fantastic, even I can follow your instructions to post a You Tube video clip! Now I'm going to have to find more amazing video clips to put up. Wow. I am so jacked up. So, the story goes, Boy13 was invited by a friend to the White Sox game September 16th. The boy's father had bought a special package with great parking, tickets, and food at one of those charitable auctions. The night before, the boys decided to prepare the sign just in case Thome hit his 500th homerun. They knew they'd be sitting down close behind homeplate. They met Thome's father (with his pregnant wife who is crying in the clip), went up and introduced themselves. The score is tied in the bottom of the ninth with one man on, and Thome hits a walk-off. I don't think it could have got more exciting. Unless, of course, Thome played for the Cubs. 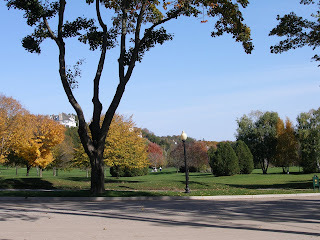 Time to blog, but what to blog about. I got my flu shot last week and my arm finally stopped aching. I usually get one every year, since work pays for it, though I'm not sure that is a good reason, after reading Ragged's blog comments. I don't think I've had the flu since Boy19 was two years old. I'm not sure what the flu is exactly, especially the one I was vaccinated for, but that spring in March I got sick, missing work at the bakery I was temporarily working at, which is unusual for me. I felt like I didn't recovery for 2-3 weeks. It was scary, not knowing when or if I would ever be back to normal. I have missed the shot from time to time when supplies were limited to the elderly, infirm, etc. Speaking of flu, I want to see that movie Something something in the Time of Cholera. I don't know what it's about exactly, but it looks good, one of those period pieces I imagine like Pride and Prejudice. Never mind that I didn't see that one and it was probably exceedingly boring. Note to self: add Ocean's 13 to my Christmas list. I don't think I saw it, but I think I know the plot. That brings me to People Magazine's Sexiest Man Alive. Finally, they got the right guy. Did anyone notice, though, they have completely airbrushed his face for the cover? All of his perfectly human imperfections have been removed. So sad. In responding to the honor, he reveals more about his personal life than ever, in trying to defend how he's not going to talk about his personal life. Interesting. I'll forgive him that. One thing I like is his commitment to privacy. 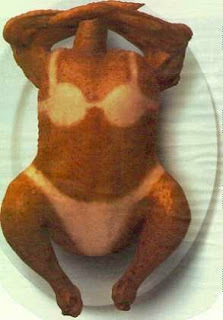 I thought I would try this new recipe my aunt sent me this year. I don't know how to post a You Tube video (and am not in the mood to learn) but we finally got Boy13 posted on You Tube when he was on TV for Jim Thome's 500th homerun back in September. It takes a while to get to the end, but you will see him in a yellow LSU shirt jumping up and down if you are patient. Pat and I finally got around to hanging the new drapes for the living room that came from JC Penney Oct. 16. There are very ahh, comprehensive. The idea was to get thermal coverage and warm up the house for the winter. Figured out one piece of the valance for the big window was the missing component. I had received a letter saying one part was not shipped. So I took the shaped valances back to the local store for shipping, and re-ordered scalloped valances for all the windows. They should be easy to put up, now that all the rods are in place. There was a minimum of swearing and frantic looking for the drill bits, etc. He has also put plastic up on several of the draftier West windows which should help. Regarding the make-up. I told Boy13 I was going to put my make-up on today (since I bought $40 worth) and he gave such a petrified look, I know he thinks I look like Tammy Faye Baker, even though he doesn't actually know who she is. My nephew8 told his mom that he had eaten Chocolate Lucky Charms at my house and thrown up one time. Is there such a thing as Chocolate Lucky's? I don't think this happened, Bets. The cooler weather has set in, and I'm none too happy about it. The wind has died done so it is not so bad. Last night I gorged on a free dinner provided by the School of Social Work which was billed as a 'social' and getting to know the new students joining our cohort in January. 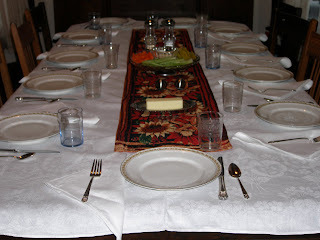 It failed on the social account, because there were no formal introductions, and people sat wherever and only mingled with the small group at their table, if that. But the food was fantastic- pasta dish must've had MSG in it because I couldn't stop eating it. Key Lime pie for dessert, very sweet. I had a stomach ache all night. Today I got nervey and stopped at the Clinique counter for a makeover. Wow, now I know why they call it "putting on my face" in the morning. It looked like someone else had taken over my head. Boy13 hid his eyes and said, "You're scaring me." Well, it was a drastic change. I do think it is time to start wearing some degree of make-up, however. It helps with the dark circles, age spots and other inconsistencies of old age. It's time to get some work done on my next paper due December 3rd. Substance abuse in adolescents. Since I don't have much else going on right now I will share a couple more pics from beautiful Michigan and Mackinac Island. 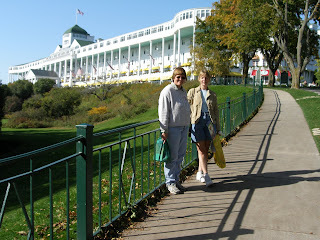 From the top we have a golf course belonging to the Grand Hotel on Mackinac Island. Below that Terri and me in front the hotel. I believe it cost $12 to go in and look around the hotel which obviously we didn't do. After 6pm Gents must wear coat and tie, and Ladies, no slacks. With rooms starting at $367 this was not our kind of place. The large abode is Brenda and Roger's place in Ithaca. 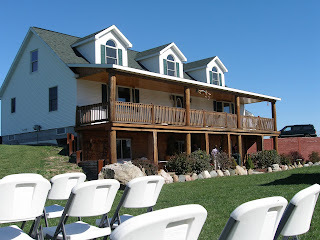 The white chairs are set up for the wedding ceremony. 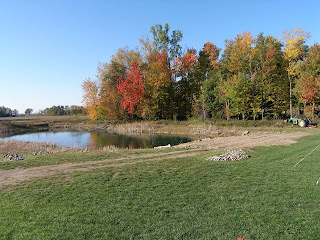 Below that, the lovely trees and pond that the house overlooks to the West. A really nice spot. I see why she left this area. The Canadian folks were saying that people are either Mountain, Ocean or Flatlanders. I guess that makes me a flatlander, though it doesn't sound real flattering.